The kindergarten curriculum is organized through a structure of daily, weekly and seasonal rhythms. The daily rhythm follows a consistent schedule that provides a secure structure for the children. The daily rhythm includes a planned activity for each day that is repeated weekly (baking, painting, modeling, coloring and crafts), free play, circle time (recitation, singing and movement), snack, story and outdoor play. The curriculum focus changes with each season, providing inspiration for crafts, songs, stories, practical life, gardening and cooking projects. Daily story telling, poetry recitation accompanied by movement, singing and vivid imaginative speech allow for a full and varied experience of language. The result of being immersed in such a rich oral environment is a subtle degree of refinement in the child’s ability to listen, comprehend, recite and internalize oral rhythms and inflections. The kindergarten curriculum plants the seeds of a deep love and pleasure in language and literature. Leann Tourzan was born in Portland, Oregon. She spent much of her childhood camping throughout the Pacific Northwest with her family. After high school she moved to Ashland, Oregon where she fell in love with the natural diversity and connected with the communities she encountered throughout the region. She attended S.O.U. and received a BA in International Studies. After graduation Leann spent several years travelling the world and doing service work overseas. Leann returned to S.O.U. in 1999 and earned her Masters in Early Childhood Education. She worked at an alternative program sponsored by the Ashland School District for many years where she met several inspiring Waldorf teachers. This experience deepened her understanding of child development and ignited her passion to become a Waldorf teacher. 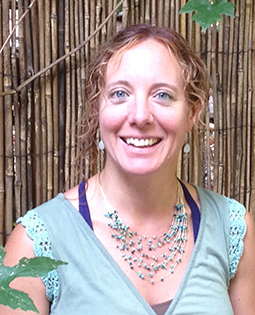 After having two children of her own and running a Waldorf-inspired home-based program called Fairy Ring Forest School in Ashland, Leann decided to join the Madrone Trail. Leann has now finished her Masters in Waldorf Early Childhood Education and is excited to be working in the public sector, bringing a more balanced approach and preserving the importance of imaginative play as the foundation for later academic success. Leann enjoys hiking, gardening, crafting, and most of all being a mom!